With the technological advancement in ART (assisted reproductive technology) couples who were once considered infertile are now able to conceive and give birth to biological offspring using costly reproductive treatment. Researchers from Tehran, Iran recently studied the growth rate of infants born after ART compared to infants conceived naturally. All infants were conceived at the Royal Institute in Iran. There were 333 births in all. 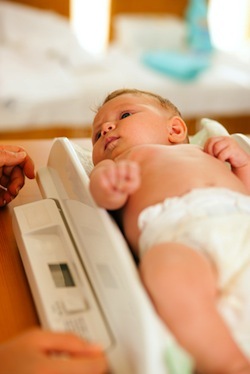 Infant weight, height, physical characteristics and head circumference was measured for each study participant and the measurements were compared with current normal rate growth charts. Conclusion: Multiples pregnancy is the most common confounding factor in terms of birth size. ART produces more multiple pregnancies and thus infants tend to be smaller at birth and weight loss than infants born via singlet pregnancy. Infants conceived via ART also measured smaller than naturally conceived infants (singlet pregnancies). But, the difference in size narrowed dramatically as the infants aged to nine months. Source: Kermani RM, Zoljalali S, Kouhpayezadeh J, Nateghi MR, Shahzadehfazeli A, Nedaifard L. Evaluation of the growth process of infants conceived by assisted reproductive techniques at royan institute from birth to 9 months. Iran J Pediatr. 2011 Dec;21(4):449-54.